Members of the Syrian Coalition’s political committee met with officials of the Syrian Interim Government (SIG) and the newly formed FSA General Staff in the Turkish city of Gaziantep on Friday. The meeting, which was chaired by the Coalition president Riad Seif and SIG’s Head Jawad Abu Hatab, discussed the projects being implemented and developed by SIG in the liberated areas. Seif pointed out that SIG’s presence in the four areas covered by the “de-escalation zones agreement” would help preserve the unity of Syria and thwart attempts to divide the country. By setting up administration in the liberated areas, SIG will be able to unify the law courts, education curricula and achieve sectoral unity, Seif added. With regards to the situation in Idlib, Seif noted that the Coalition is closely watching the situation in the province. “Our priority has always been to protect civilians from the crimes of the Assad regime,” he stressed. Seif stressed that the Coalition is a key partner in the efforts aimed at bringing Idlib back to the “revolution’s social base” through assigning SIG the task of administering the province in cooperation with the Free Syrian Army. For his part, Abu Hatab said that they had come a long way on the road to build a national army and stamp out factionalism, adding that this step will support SIG’s position and contribute to the protection of the liberated areas from any possible aggression. Abu Hatab also said that SIG works tirelessly to improve the reality of services being offered to the civilian population and to provide better living conditions for those who were displaced from their homes by the Assad regime. Israeli occupation authorities have intensified the restrictions imposed on Palestinian residents of Hebron, according to an update by UN OCHA. A new fence installed by Israeli occupation forces around two Palestinian neighbourhoods in the so-called “H2” area of the city, As Salaymeh and Gheith, has further separated up to 1,800 Palestinians from the rest of the city. According to UN OCHA, this latest measure “is in addition to the recent reinforcement (including the instalment of turnstiles) of two pre-existing checkpoints controlling access to the area where the new fence was installed”. Such developments “disrupt the livelihoods and family life of Palestinians living in the two neighbourhoods and limit access to basic services like health and education”. In May 2017, UN OCHA relates, Israel installed an approximately 50 metre-long and 1.5-metre-high metal bar fence on top of concrete slabs, with a gate, next to a metal fence initially installed in 2012 to surround As Salaymeh and Gheith. “According to residents, Israeli Border Police manning the gate close it irregularly, without prior notice, leaving residents in a state of constant uncertainty”. Meanwhile, the main street behind the fence is used by Israeli settlers from Kiryat Arba settlement to access the Ibrahimi Mosque on foot or by car; however, “Palestinian vehicular movement along this street is prohibited”. Some 600 children enrolled in schools outside the restricted area regularly use alternative routes between houses and alleys. This can add 1.5km to their journey “and exposes them to friction with Israeli settlers and soldiers”. One 13-year-old boy cited by UN OCHA, 13-year-old Farhat al Rajabi, said: “My journey to school has become more difficult. I hate the gate. A few weeks ago I was arrested by the police after kicking the gate with my foot when the soldiers refused to open it for me”. The fortification of two checkpoints in mid-2016 already hampered the entry of commodities into the As Salaymeh and Gheith neighbourhoods, and to other neighbourhoods in the settlement-affected area of the city. “Other measures have been imposed at these checkpoints”, reports UN OCHA, “such as prohibiting men under 40 from entering on Fridays: a measure which was first implemented in 2015 and has become systematic since May 2016”. The H2 area includes four Israeli settlement compounds, home to a few hundred Israeli settlers and a population of over 40,000 Palestinians. 30 per cent of the Palestinians living in H2 reside in neighbourhoods adjacent to the settlement compounds and are affected by strict access restrictions. Currently, there are over 100 physical obstacles, including 20 permanently staffed checkpoints and 14 partial checkpoints that separate the settlement area from the rest of the city. Several streets within this area are designated for the exclusive use of settlers and are restricted for Palestinian traffic. In some streets, Palestinian pedestrians are banned. The coercive environment generated by access restrictions, along with systematic harassment by Israeli settlers, has resulted in the forcible transfer of thousands of Palestinians and a deterioration in living conditions of those who remain. A recent survey indicates that a third of Palestinian homes in the restricted area (1,105 housing units) are currently abandoned. Over 500 commercial establishments have been shut down by military order, and at least 1,100 others have been closed by their owners because of closures and restricted access for customers and suppliers. Egyptian President Abdel Fattah Al-Sisi extended yesterday Egypt’s countrywide state of emergency for an additional three months. The renewed three-month state of emergency will start today, according to a presidential decree. “The state of emergency will be applied across the country, effective as of 1:00 am on Friday, for an additional three months, due to ongoing security concerns,” the presidential decree read. “The armed forces and the police will take the necessary measures to confront the dangers of terrorism,” the decree added. The Egyptian parliament is yet to approve the presidential resolution. Egypt first imposed the state of emergency in April after two church bombings, which Daesh claimed responsibility for, killed at least 45 people. It was then extended in July for a further three months. The state of emergency allows authorities to carry out additional security measures, including the referral of terrorism suspects to state security courts, the imposition of curfews and strict control over newspapers. A member of the Christian-Islamic Committee in support of Jerusalem and the Holy Places, Father Manuel Musallam, has called for the Palestinian resistance groups not to give up their weapons, and to retain them until Palestinians receive their full rights and freedom. The second demand, he added, is to keep the resistance weapons to protect Palestine and the Palestinian people, as well as the Palestinian reconciliation. He described any attempt to remove the weapons as “treachery”. The Islamic Resistance Movement, Hamas, and Fatah signed a reconciliation agreement in the Egyptian capital of Cairo on Thursday. Israel insists on Hamas laying down and surrendering its arms. Read: Should we bid Hamas farewell? At just 26 years-old, Yousra Badwan is Palestine’s youngest female mayor after being elected to the post in the Azzun municipality of the occupied West Bank earlier this year. Badwan tells MEMO about her reasons for pursuing political office, and how she hopes to help her community in the face of the Israeli occupation. Having graduated from Palestine’s Technical University with a degree in Electrical Engineering, a career in politics was not the obvious choice for West Bank resident Yousra Badwan. As she observed the struggles of those in her community, though, particularly those faced by women, her desire to make a difference led her to aim high. “I wanted to participate effectively in the community and prove that a young Palestinian woman is able to run alongside the men and can bear responsibilities and make decisions,” she explains. In 2016, Badwan fulfilled her ambitions and ran in the local election as part of a political bloc, but after the election was postponed by the Palestinian Authority (PA), she returned as an independent candidate and secured a majority vote for the position of mayor in May of this year. She has now left her job as an engineer in Ramallah and is a full-time politician. However, things changed quickly once she took office. “The people of Azzun began to accept me after they realised that there were tangible changes being made on the ground,” she says, stressing that she remains undeterred. Badwan identifies numerous challenges in her 12,000 member community that she hopes to address during her term; the most significant are those posed by the daily incursions on Palestinian life as a result of the Israeli occupation. This is the positive message that she wants to get across to her peers in the community. Given her determination to succeed, who is to say that she will not succeed in this, just as she has succeeded in reaching her current position? According to reports, the US made its announcement first, with the Trump administration officially notifying the organization that it would be withdrawing its membership and establish an observer mission to replace its representation at the agency. Shortly after the Trump administration’s announcement, Israeli Prime Minister Benjamin Netanyahu’s office said it would be following the US’ move, which it called “a brave and moral decision” in a statement. “UNESCO has become a theatre of absurd. Instead of preserving history, it distorts it,” Netanyahu said. 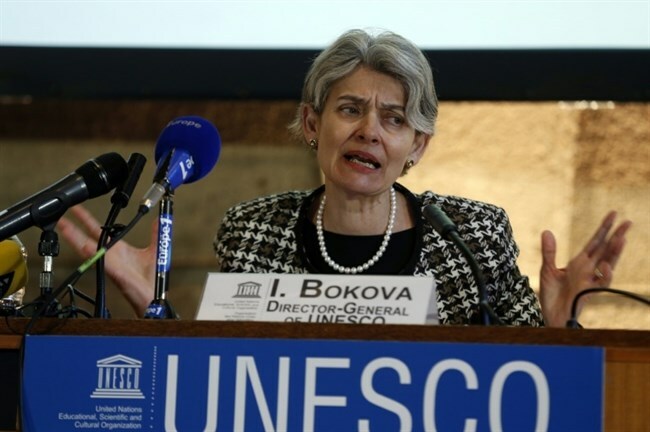 “At the time when conflicts continue to tear apart societies across the world, it is deeply regrettable for the United States to withdraw from the United Nations agency promoting education for peace and protecting culture under attack,” Bokova said. The US and Israel’s relationship with UNESCO has been tense for years, long before Trump took office. The US stopped paying its dues to the organization in 2011 when UNESCO members granted Palestine full membership of the body, despite heavy opposition from Israel. In July, Israel decided to withhold a further $1 million in membership dues to UNESCO following the organization’s vote to inscribe Hebron’s Old City and Hebron’s Ibrahimi Mosque in the occupied West Bank on the World Heritage in Danger list. According to The Times of Israel, the cut in Israeli funding to the UN was the fourth since December 2016 — when the UN Security Council passed Resolution 2334 condemning Israel’s illegal settlement enterprise in the occupied Palestinian territory — with Israel only paying $1.7 million out of $11.7 million in required dues, over its claims of anti-Israel bias in the international body. Both Israel and Trump’s administration have regularly criticized the UN for what they deem is the unfair targeting of Israel over its breaches of international law, particularly its illegal settlement expansion in the occupied Palestinian territory. Since the Trump Administration’s advent to power, and with the help of his ambassador to the UN, Nikki Haley, Washington and Israel have waged a war against the UN, using intimidation and the threats of withholding funds. Israeli soldiers abducted, on Wednesday at night, a Palestinian child in the Old City of occupied East Jerusalem, in the West Bank, after several colonists attacked homes and stores – the child was released and after his family was forced to pay a fine, and was placed under house arrest. 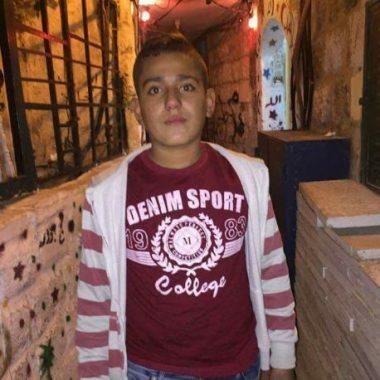 Eyewitnesses said that a group of Israeli colonists attacked many homes and stones in Jerusalem’s Old City, before the soldiers invaded the area and abducted a child, identified as Ya’coub Dabagh, 15, and took him to an unknown destination. The child remained under interrogation for several hours, without legal representation, before the army released him after ordering him under house arrest for five days, and forcing his family to pay a 500 Shekels fine. It is worth mentioning that the colonists attacked many Palestinians, and their property, in the al-Khaldiyya neighborhood, in the Old City, while scores more invaded the Bab an-Nather area and the African neighborhood. The attackers caused serious property damage to many cars and stores, in addition to several injuries among the Palestinians. 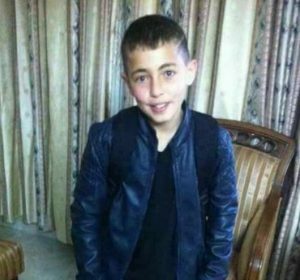 In related news, the soldiers invaded Zeita town, north of Tulkarem, in the northern part of the West Bank, and abducted a child, identified as Ehab Nafeth Masarwa, 12, while walking in front of his school. Israeli forces continued with systematic crimes in the occupied Palestinian territory (oPt) for the week of 05 – 11 October, 2017. 5 Palestinian civilians, including 4 children, were wounded in the West Bank and Gaza Strip, while Israeli forces conducted 68 incursions into Palestinian communities in the West Bank and a limited one into the Gaza Strip. During the reporting period, Israeli forces wounded 5 Palestinian civilians, including 4 children, in the West Bank and Gaza Strip. In the Gaza Strip, Israeli naval forces continued to chase Palestinian fishermen in the Sea and open fire at farmers and houses in the border areas. In the West Bank, 05 October 2017, a Palestinian child was wounded when Israeli soldiers who established a checkpoint in al-Sweitat area, south of Jenin, opened fire at civilians in the vicinity of the checkpoint. The child was hit with a bullet to the right thigh and then arrested along with two other civilians. They were taken to al-Jalamah checkpoint, north of the city. The child was then transferred via a Palestine Red Crescent Society (PRCS) ambulance. On 10 October 2017, a 14-year-ld child was wounded with a rubber-coated metal bullet to his right foot when Israeli forces opened fire at youngsters protesting against the soldiers’ incursion into al-Thaher area near “Karmei Tzur” settlement, south of Beit Ummer village, north of Hebron. On 11 October 2017, an 18-year-old civilian, from ‘Askar al-Jadid refugee camp, northeast of Nablus, was hit with 3 rubber-coated metal bullets to the back, left shoulder and right leg. He was wounded when Israeli forces moved into the city to secure the entry of dozens of buses carrying settlers to Josef’s Tomb in Balatet al-Balad, so dozens of children and youngsters protested against them. In the Gaza Strip, the border areas witnessed protests against the on-going unjust closure on the Gaza population. During the protests, the Israeli forces used force against the protestors and opened fire in order to disperse them. As a result, 2 children were wounded; one of them in al-Brueij refugee camp in the central Gaza Strip with a bullet to the right thigh and the other in eastern Jabalia in the northern Gaza Strip with a bullet to the right leg. In the pretext of targeting Palestinian fishermen in the Sea, on 05 October 2017, Israeli gunboats opened fire at the Palestinian fishing boats, northwest of Beit Lahia in the northern Gaza Strip and chased them. The shooting recurred in the same area on 07 October 2017. On 06 October 2017, Israeli gunboats opened fire at the Palestinian fishing boats, west of al-Soudaniya, west of Jabalia in the northern Gaza Strip, and chased them. The shooting recurred in the same area on 07 October 2017. The shooting forced the fishermen to flee for fear of being wounded. However, neither casualties nor damage to the boats were reported. In the context of targeting the border areas, on 07 October 2017, Israeli forces stationed along the border fence between the Gaza Strip and Israel, north of Um al-Nasser “Bedouni Village” in the northern Gaza Strip, sporadically opened fire at the border area. However, neither casualties nor damage to property were reported. On 09 October 2017, Israeli forces stationed along the border fence between the Gaza Strip and Israel opened fire at the lands and houses, east of al-Bureij and Gaza Valley village in the central Gaza Strip. Neither casualties nor damage to the property were reported. On the same day, Israeli forces stationed along the border fence between the Gaza Strip and Israel fired 2 artillery shells at a watchtower belonging to the Palestinian armed groups, east of al-Maghazi in the central Gaza Strip. As a result, the watchtower sustained damage, but no casualties were reported. Israeli forces re-shelled the abovmentioned watchtower on 11 October 2017. During the reporting period, Israeli forces conducted at least 68 military incursions into Palestinian communities in the West Bank. During those incursions, Israeli forces arrested at least 46 Palestinian civilians, including 7 children and a woman. Three of those were arrested in Jerusalem and its suburbs. In the Gaza Strip, on 10 October 2017, Israeli forces moved into the southeastern side of Beit Hanoun village in the northern Gaza Strip. They patrolled to the south and stationed off Abu Safiyah Military Site, east of Jabalia. They levelled and combed vacant lands previously levelled amist Israeli sporadic shooting. They later redeployed along the border fence between the Gaza Strip and Israel. 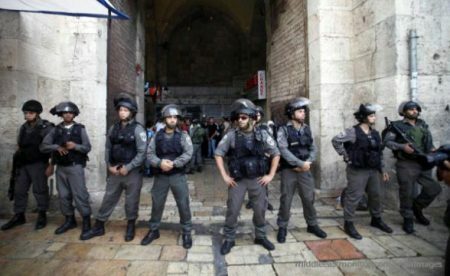 In the context of Israeli settlers’ attacks against Palestinian civilians and their property, hundreds of settlers raided al-Aqsa Mosque and is yards in East Jerusalem’s Old City while prayers and demonstrations were held in al-Buraq Wall yard and Silwan village, south of the mosque, to mark the Jewish Sukkot Holiday. As a result, the Israeli police closed the roads to the area, and a helicopter was hovering over the city. As part of settlers’ attacks against Palestinian civilians and their property, on 05 October 2017, 3 settlers near “Shilo” settlement on Ramallah-Nablus Road threw stones at a Palestinian civilian car carrying 3 civilians. As a result, its window was broken and one of the passengers was hit with a stone to the right side of his head. The wounded civilian was taken to Istishari Hospital in al-Rihan Suburb, north of Ramallah. Following medical check-up, it was found out that he suffered from a skull fracture and severe bleeding in his head, so he is in the ICU now due to his serious condition. On 06 October 2017, Israeli settlers gathered on Bypass Road 60 near the sub-road leading to Kherbet al-Boq’ah, east of Hebron, to throw stones at the Palestinian vehicles traveling on the road. As a result, the window of a car belonging to Nemer Jaber (40) was broken, and his daughter, Yafa, sustained glass shrapnel wounds. She was taken to the Hebron Governmental Hospital to receive medical treatment. Israel continued to impose a tight closure of the oPt, imposing severe restrictions on the movement of Palestinian civilians in the Gaza Strip and the West Bank, including occupied East Jerusalem. The illegal closure of the Gaza Strip, which has been steadily tightened since June 2007 has had a disastrous impact on the humanitarian and economic situation in the Gaza Strip. The Israeli authorities impose measures to undermine the freedom of trade, including the basic needs for the Gaza Strip population and the agricultural and industrial products to be exported. For 9 consecutive years, Israel has tightened the land and naval closure to isolate the Gaza Strip from the West Bank, including occupied Jerusalem, and other countries around the world. This resulted in grave violations of the economic, social and cultural rights and a deterioration of living conditions for 2 million people. The Israeli authorities have established Karm Abu Salem (Kerem Shaloum) as the sole crossing for imports and exports in order to exercise its control over the Gaza Strip’s economy. They also aim at imposing a complete ban on the Gaza Strip’s exports. The Israeli closure raised the rate of poverty to 65%. Moreover, the rate of unemployment increased up to 47% and youth constitutes 65% of the unemployed persons. Moreover, 80% of the Gaza Strip population depends on international aid to secure their minimum daily needs. These rates indicate the unprecedented economic deterioration in the Gaza Strip. In the West Bank, Israeli forces continued to suffocate the Palestinian cities and village by imposing military checkpoints around and/or between them. This created “cantons” isolated from each other that hinders the movement of civilians. Moreover, the Palestinian civilians suffering aggravated because of the annexation wall and checkpoints erected on daily basis to catch Palestinians. On Sunday, 08 October 2017, hundreds of Israeli settlers raided al-Aqsa Mosque in occupied East Jerusalem’s Old City. Moreover, they performed prayers and organized demonstrations in al-Buraq Wall yard and Silwan village due to the Jewish Sukkot holiday. The Islamic Endowment Department (Awqaf) stated that around 524 Israeli settlers raided al-Aqsa Mosque in the morning and afternoon; around 366 settlers raided the mosque in the morning while 158 others in the afternoon via al-Magharebah Gate. The Israeli settlers wandered the mosque’s yards while the Israeli soldiers were heavily deployed in the area. During the storming, many Israeli settlers performed prayers in the al-Aqsa Mosque while other settlers wandered and performed their rituals at the gates outside. Moreover, Member of Israeli Knesset Yehuda Glick, performed prayers at al-Qataneen Gate outside. Furthermore, thousands of Israeli settlers performed prayers of Jewish Sukkot holiday in al Buraq Wall yard, and the Israeli police closed all roads leading to the area. Moreover, a helicopter hovered over the city. The Israeli forces also closed all roads leading to Silwan village in conjunction with the Israelis’ arrival at the village to perform their rituals and prayers in al-Tantour Fer’oun and ‘Ain Silwan areas. On Monday, 09 October 2017, Israeli settlers continued to raid al-Aqsa Mosque for the 2ndconsecutive day. The Islamic Endowment Department (Awqaf) stated that hundreds of Israeli settlers raided al Aqsa Mosque in the morning and afternoon via al-Magharebah Gate. The raiders were 612 Israeli settlers, including 150 Israeli students. On Tuesday, 10 October 2017, hundreds of Israeli settlers raided al-Aqsa Mosque for the 3rd consecutive day under the Israeli forces protection. The Islamic Endowment Department (Awqaf) stated that around 628 Israeli settlers raided al-Aqsa Mosque in the morning and afternoon via al-Magharebah Gate and wandered the mosque yards. Moreover, the Israeli police checked the Palestinian worshipers’ IDs before entering the mosque, especially in the morning. In the morning, hundreds of Israeli settlers moved into occupied East Jerusalem’s Old City and headed towards al-Buraq Wall. They were holding palm fronds to perform their prayers due to Jewish Sukkot holiday. They also wandered and performed prayers outside at al-Aqsa Mosque Gates. At approximately 21:45 on Thursday, 05 October 2017, 3 Israeli settlers who were on the right side of street near “Shilo” settlement on Ramallah-Nablus Road attacked a Palestinian car carrying 3 Palestinian National Security officers. The Israeli settlers threw stones at the vehicle, breaking its windshield. As a result, Mohamed Mahmoud Jarar’ah (26), from ‘Asira village, north of Nablus, was hit with a stone to the right side of thehead. Mohamed was then taken to hospital in al-Rihan suburb, north of Ramallah. Medical tests showed that Mohamed suffers from a skull fracture and severe bleeding in the head. He is so far in the intensive care unit (ICU) due to his serious health condition. At approximately 10:00 on Friday, 06 October 2017, dozens of Israeli settlers from “Kiryat ‘Arba’” and “ Kharsina” settlements gathered on Bypass Road (60) near a sub-road leading to Khirbet al-Boq’a, east of the city, where many Palestinian families live. The Israeli settlers threw stones at the Palestinian vehicles. When Nimer Jaber (40) traveling his car arrived on the sub-road leading to Khirbet al-Boq’a, the Israeli settler threw stones at his vehicle. As a result, the vehcile’s windows were broken, and his daughter Yaffa sustained glass shrapnel She was then taken to Hebron Hospital to receive medical treatment. At approximately 23:20 on Saturday, 07 October 2017, hundreds of Israeli settlers moved into ‘Awerta village, south of Nablus, under the Israeli forces protection. They performed their Talmudic rituals around Jewish historical tombs as they claim. In the next day morning, 08 October 2017, the Israeli settlers and soldiers withdrew from the village, and no further incidents were reported. 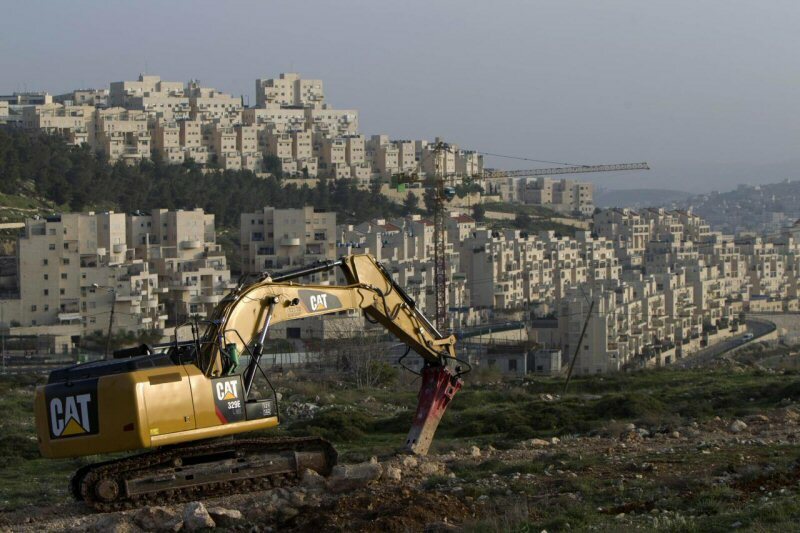 PCHR warns of the escalating settlement construction in the West Bank, the attempts to legitimize settlement outposts established on Palestinian lands in the West Bank and the continued summary executions of Palestinian civilians under the pretext that they pose a security threat to the Israeli forces. PCHR reminds the international community that thousands of Palestinian civilians have been rendered homeless and lived in caravans under tragic circumstances due to the latest Israeli offensive on the Gaza Strip that has been under a tight closure for almost 10 years. PCHR welcomes the UN Security Council’s Resolution No. 2334, which states that settlements are a blatant violation of the Geneva Conventions and calls upon Israel to stop them and not to recognize any demographic change in the oPt since 1967. PCHR hopes this resolution will pave the way for eliminating the settlement crime and bring to justice those responsible for it. PCHR further reiterates that the Gaza Strip and the West Bank, including East Jerusalem, are still under Israeli occupation in spite of Israel’s unilateral disengagement plan of 2005. PCHR emphasizes that there is international recognition of Israel’s obligation to respect international human rights instruments and international humanitarian law. Israel is bound to apply international human rights law and the law of war, sometimes reciprocally and other times in parallel, in a way that achieves the best protection for civilians and remedy for the victims. PCHR calls upon the international community to respect the Security Council’s Resolution No. 2334 and to ensure that Israel respects it as well, in particular point 5 which obliges Israel not to deal with settlements as if they were part of Israel. PCHR calls upon the ICC in 2017 to open an investigation into Israeli crimes committed in the oPt, particularly the settlement crimes and the 2014 offensive on the Gaza Strip. PCHR Calls upon the European Union (EU) and all international bodies to boycott settlements and ban working and investing in them in application of their obligations according to international human rights law and international humanitarian law considering settlements as a war crime. PCHR calls upon the international community to use all available means to allow the Palestinian people to enjoy their right to self-determination through the establishment of the Palestinian State, which was recognized by the UN General Assembly with a vast majority, using all international legal mechanisms, including sanctions to end the occupation of the State of Palestine. PCHR calls upon the international community and United Nations to take all necessary measures to stop Israeli policies aimed at creating a Jewish demographic majority in Jerusalem and at voiding Palestine from its original inhabitants through deportations and house demolitions as a collective punishment, which violates international humanitarian law, amounting to a crime against humanity. PCHR calls upon the international community to condemn summary executions carried out by Israeli forces against Palestinians and to pressurize Israel to stop them. PCHR calls upon the States Parties to the Rome Statute of the ICC to work hard to hold Israeli war criminals accountable. PCHR calls upon the High Contracting Parties to the Geneva Conventions to fulfill their obligations under article (1) of the Convention to ensure respect for the Conventions under all circumstances, and under articles (146) and (147) to search for and prosecute those responsible for committing grave breaches of the Geneva Conventions to ensure justice and remedy for Palestinian victims, especially in light of the almost complete denial of justice for them before the Israeli judiciary. PCHR calls upon the international community to speed up the reconstruction process necessary because of the destruction inflicted by the Israeli offensive on Gaza. PCHR calls for a prompt intervention to compel the Israeli authorities to lift the closure that obstructs the freedom of movement of goods and 1.8 million civilians that experience unprecedented economic, social, political and cultural hardships due to collective punishment policies and retaliatory action against civilians. PCHR calls upon the European Union to apply human rights standards embedded in the EU-Israel Association Agreement and to respect its obligations under the European Convention on Human Rights when dealing with Israel. PCHR calls upon the international community, especially states that import Israeli weapons and military services, to meet their moral and legal responsibility not to allow Israel to use the offensive in Gaza to test new weapons and not accept training services based on the field experience in Gaza in order to avoid turning Palestinian civilians in Gaza into testing objects for Israeli weapons and military tactics. PCHR calls upon the parties to international human rights instruments, especially the International Covenant on Civil and Political Rights (ICCPR) and the International Covenant on Economic, Social and Cultural Rights (ICESCR), to pressurize Israel to comply with its provisions in the oPt and to compel it to incorporate the human rights situation in the oPt in its reports submitted to the relevant committees. PCHR calls upon the EU and international human rights bodies to pressurize the Israeli forces to stop their attacks against Palestinian fishermen and farmers, mainly in the border area. Fully detailed document available at the official website of the Palestinian Centre for Human Rights (PCHR). Dozens of Israeli settlers attacked properties of Palestinians, in the Old City of occupied East Jerusalem, on Thursday, as they made their way to Al-Aqsa Mosque compound under the protection of Israeli forces. Locals told Ma’an News Agency that, around dawn, Israeli settlers threw rocks and chairs at Palestinian shopfronts inside the Old City, and damaged Palestinian cars in the Aqabat al-Khaldiyeh and Council Gate areas, outside the walls of the Old City. Sources added that Palestinian youth “attempted to stop the settlers,” but they were unsuccessful, as Israeli forces maintained a heavy security presence around the settlers. Meanwhile, Israeli forces closed main roads and streets in the Silwan neighborhood, south of the Old City, in order to allow Israeli settlers living in the area to head to the Al-Aqsa Mosque Old for ongoing Jewish holidays. Al-Aqsa Mosque compound, which sits just above the Western Wall plaza, houses both the Dome of the Rock and the Al-Aqsa Mosque. The third holiest site in Islam, it is also venerated as Judaism’s most holy place, as it sits where Jews believe the First and Second Temples once stood. The Second Temple was destroyed by the Romans in 70 AD. Tensions around the Al-Aqsa Mosque compound were a main contributor to the increasing unrest that erupted in October 2015, after right-wing Israelis made frequent visits to the site during a succession of Jewish holidays. Meanwhile, ahead of the beginning of Sukkot, Israel announced an 11-day general closure for both the West Bank and Gaza — during which only humanitarian, medical, and exceptional cases were to be allowed to exit or enter — between Oct. 4 and Oct. 14. Israel regularly imposes closures on the West Bank and Gaza for Jewish holidays, but week-long festivals like Sukkot usually only have closures imposed at the end of the holiday, lasting a few days. The Israeli army, today, announced a decision to put hands on 36 dunams of agricultural land in the Ras Al-Ahmar area, in the northern Jordan Valley. 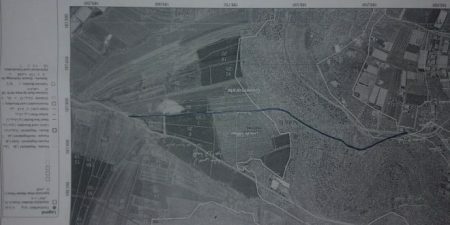 Local sources said, according to the PNN, that the Israeli commander handed residents of the area notices in Arabic and Hebrew, with a map of the area showing the lands that will be seized.